I don’t know what’s going on. I got porcelain veneers a year and a half ago. They looked beautiful when they were first placed. But, a few weeks after my six-month check up they started picking up stains. They come off whenever the hygienist cleans them at my next appointment, but it doesn’t take long for them to start picking up stains again. The dentist said it’s something I’m doing, but my natural teeth never stained this badly. Do you have any idea what can be causing this? Porcelain veneers are actually more stain resistant than your natural teeth. So, if the smile you had before wasn’t being stained by your habits, you don’t seem to be the problem. The timing of when your porcelain veneers first starting picking up stains is the biggest clue. You mentioned it happened very shortly after your check-up. My suspicion is the hygienist used something during her cleaning which led to the glaze being removed from your porcelain veneers. Once that happens, it will continue to pick up stains rapidly. Yes, the cleanings you get at check-ups will remove them, but they’ll come right back. Unfortunately, this can’t be fixed. While there is a diamond polishing technique that could help, it’s an extremely advanced procedure and very few cosmetic dentists know it. The only thing to do at this point is have them replaced. Because this was likely the fault of your dentist’s staff, they should be willing to front most of the cost of replacement. If they give you trouble, you could have an expert cosmetic dentist in your area look at the veneers to give a second opinion as to what happened. If it turns out the glaze was removed, that could put pressure on your dentist to make things right. Most dentists care about their reputation among their peers. In order to find an expert cosmetic dentist, you can check with mynewsmile.com. They list artistic cosmetic dentists by area. Also, you can check aacd.com to see if there are any accredited dentists in your area. You’ll be in good hands with either of those. Hopefully, this situation will educate your dentist on how to properly care for porcelain veneers in the future. As an aside, make sure you’re not using any whitening toothpastes. 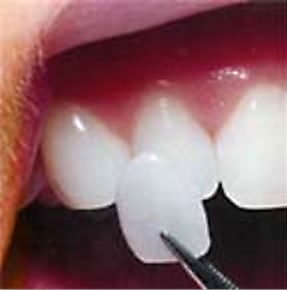 These are abrasive and can place minuscule scratches on your veneers. Instead, use a cosmetic toothpaste, such as Supersmile.